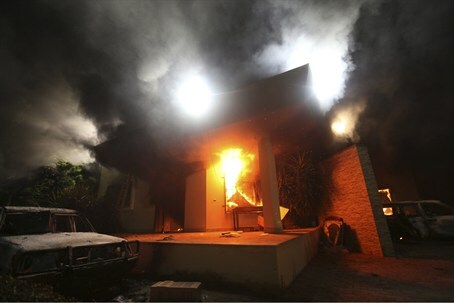 Despite pleas from Libya staff members, State Dept. removed over 30 security personnel from country in months leading up to attack. The former head of a U.S. Special Forces “Site Security Team” (SST) in Libya said that despite his pleas for additional security, the State Department removed as many as 34 security personnel from the country in the six months leading up to the terrorist attack in Benghazi that killed Ambassador Chris Stevens and three others. Lt. Col. Andy Wood said that his 16-member team and a State Department force left Libya in August despite U.S. officials in Libya asking for increased security. He said the embassy staff had approached him to express concerns regarding their safety, but said the State Department instructed diplomatic workers "to do with less." Wood told CBS News that when the forces were removed from the region he felt "like we were being asked to play the piano with two fingers. There was concern amongst the entire embassy staff." "We felt we needed more, not less," Wood said. In a statement to ABC News, the State Department said that there was not a net loss of security personnel on the ground in Libya when Wood's unit was pulled out. “The SST was enlisted to support the re-opening of Embassy Tripoli, to help ensure we had the security necessary as our diplomatic presence grew. They were based in Tripoli and operated almost exclusively there. When their rotation in Libya ended, Diplomatic Security Special Agents were deployed and maintained a constant level of security capability. So their departure had no impact whatsoever on the total number of fully trained American security personnel in Libya generally, or in Benghazi specifically," said the State Department in the statement. The State Department also noted that Wood was deployed in Tripoli and said he was unfamiliar with the security situation in Benghazi, where the terrorist attack ultimately occurred. Wood is set to appear Wednesday before a House Oversight Committee hearing, which will examine whether the Bureau of Diplomatic Security responded properly to the escalating concerns.